According to the Australian Koala Foundation, there is currently no legislation, anywhere in the country, that can protect Koalas and Koala habitat in Australia. The listing of the koala as “vulnerable” under the Environmental Protection and Biodiversity Conservation Act in 2012 changed nothing. This is supposed to be the premier law for protecting Australia’s environment, yet it is powerless. The Australian Koala Foundation’s (AKF) research indicates that the Koala is in trouble and that extinctions of local populations have already occurred. 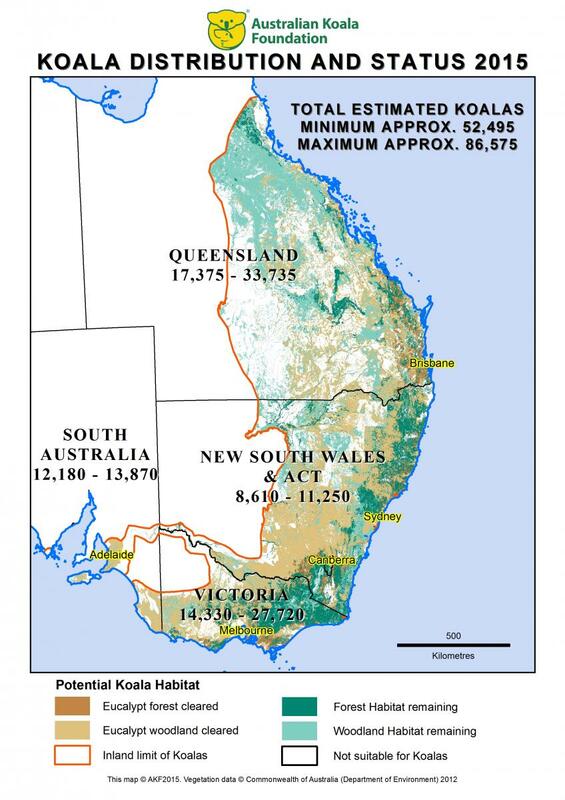 In contrast to the millions of Koalas which were thought to be present at the time of European settlement, the AKF believes that there could be less than 80,000 remaining today, possibly as few as 43,000. If this rate of decline continues then yes, the Koala is at risk of extinction. In 1902 in the state of New South Wales alone 600,000 koala skins were publicly sold. The historian Ellis Troughton has claimed that nearly 2 million koala skins were exported from Australia as recently as 1924. By the late 1920’s the Koala was almost extinct. The situation was so dire that they became extinct in the state of South Australia. There were only a few hundred left in New South Wales and a few thousand in Victoria and Queensland. “We need a national recovery plan that would mean developers have to change their behavior. And yet there’s no sign of it. They’ve got rid of so many people in the department I’m not even sure there’s anyone left who can do it” says Deborah Tabart, chief executive of the Australian Koala Foundation. Unless there’s a plan for a sustainable human population size, and a more diverse economy, then there are few options left for these iconic and world-renown animals! Habitat loss, motor vehicles and dog attacks, bush fires will all increase with housing and human population growth. The National Koala Alliance (NKA), which was launched recently, and aims to ensure the national icon survives and thrives for future generations. It is a non-profit network of koala conservation, welfare, advocacy and research groups working in habitat conservation, political lobbying and the protection of individual koalas. Biodiversity legislation is being watered down and koala habitat is being destroyed by coastal peri-urban development and other harmful activities such as industrial-scale logging in the state’s forests, poorly regulated private native forestry and mining, the article says. Corporate power and demands for resources and land, means continually loosening environmental controls, and releasing land for housing developments. Queensland Koala Crusaders secretary Vanda Grabowski said State Government law dictates all koalas that are not considered reproductively viable are euthanised. Property developers said back in 2011 that the push to list koalas as endangered will threaten an industry which employs 11 per cent of the state’s workforce. The Property Council of Australia said koalas were adequately protected! Anything in their path gets bulldozed, and with the heavy support of governments, housing always is prioritized over native animals that can go “elsewhere”!. “At the moment if a koala isn’t considered reproductively viable it is killed, that’s the law,” Ms Grabowski said. In the past 30 years, koala populations on the Sunshine Coast have dramatically declined. Unfortunately a lot of wildlife corridors are not linked, so koalas can’t move from one to another. This effectively restricts them to one area. The placement of wildlife corridors should be planned so that one links to another to allow free movement of our native wildlife. The Pacific Highway threatens to bisect koala populations in the north of NSW. Habitat loss for urban development continues on the coastal lowlands. The future looks bleak for koalas. If current declines continue, koalas will be extinct in NSW by 2055. Property developers have had a boom time, and now it’s time for a sustainable and innovative economic model. The destruction of habitats for the housing boom must end. We need to stop the addiction to “growth”, and it’s destructive bulldozing of koala habitat. We need a sustainable population plan for Australia, not just bulldozer economics! Please write to him and tell him to “lay the maps on the floor, make a coffee and ingest what you are seeing in this graphic display of science at its best”.